Vasundhara Raje led the BJP to a landslide victory of an absolute majority in the Rajasthan Assembly polls, is a regular as Polo matches in Delhi and has a political agenda ‘to change the face of things’…. The scion of the Scindia family, who led BJP to a landslide victory of an absolute majority in the Rajasthan Assembly polls, is the party’s new political favourite. In her second innings as the chief minister of the state, the daily darbars at her house that address problems of the commoners are getting bigger. The convent-educated politician with her trademark chiffon saris and pearls is capturing the hearts of the women and youth because of her royal lineage and commanding personality. An icon for Rajasthani women, she talks of a corruption-free administration, favours foreign investment for infrastructure development and wants to boost tourism in her state. 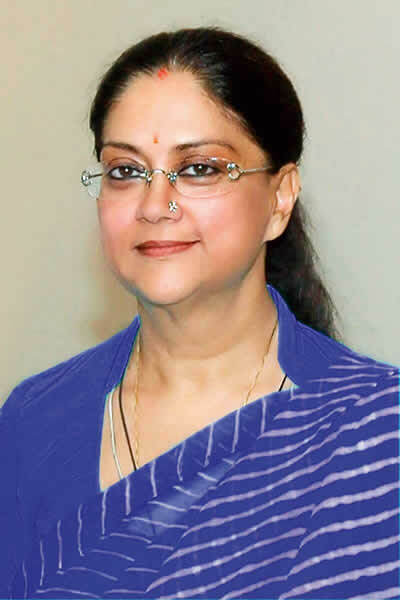 Starting off: Her mother, Vijayaraje Scindia, introduced her to politics in 1984 when she was inducted in the National Working Committee of the Bharatiya Janata Party. Penchant for: Colourful leheriyas and traditional Rajasthani jewellery. A regular at: Polo matches in Delhi. Tough times: The separation from her husband, the erstwhile ruler of Dholpur, Hemant Singh, after their son Dushyant Singh was born. Interests: Reading, horse riding, gardening and music.